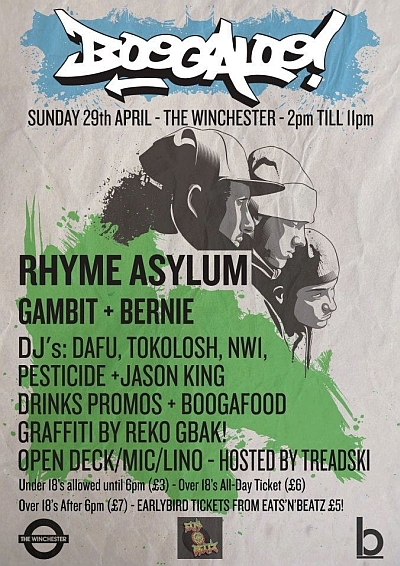 “Creativity from Boscombe’s streets, unifying culture with banging beats” A day of creativity with an urban twist.FREE ENTRY! DJ PESTICIDE , STU DAFU, and SPINAL JUNKIE, will be mixing after our workshops with hip hop and bassy beats to pleasure your earholes. If you don’t know them, get to know. The front man from the Bournemouth production outfit – Freefall Collective. They play a blend of club bangin beats, DUB sensibilities and MC action. He’lll be doing a Q&A session ending with a performance. A spoken word artist whose passionate and compelling words will blow your mind. Boards and paints provided for FREE. Come along and have a paint! A collective of artists from all fields of the arts, crafts and music world coming along to teach how to make jewellery and other accessories. 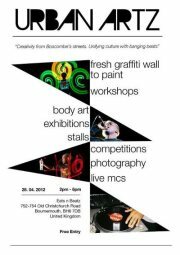 The very vibrant Boscombe Spinners will be there on the day doing their superb circus spinning. We want everyone to be colourful so come along and be transformed into something spectacular!!! Feel free to bring any young ones down if you need to, we have organised some arts and crafts activities to keep them occupied. Eats N Beatz will be selling food and refreshments through out the day with a lovely sofa area to relax in and a seated area outside. COME ALONG.. ONE DAY THING ONLY!!!! Currently under new management and ownership and we are here to bring Dusk back with a fresh outlook on life and an array of brilliant new events and lifestyle choices, whilst still staying true to who we are!! We’re focusing on the niche, keeping it eclectic and creating a bit special on the Bournemouth scene. Starting on Sat 31st March, then 21st & 28th April and weekly from 12th May 2012. Expect to hear the likes of Harlow and the Ghetto Jam DJ collective rocking out till the early hours with a mash up of House/Breaks/Big Beats and Floor Fillers. Really staying true to the Dusk Til Dawn manifesto. Please post your names on the EVENT WALL for GUEST LIST – This entitles you to FREE ENTRY before midnight and £1 OFF til 2am. 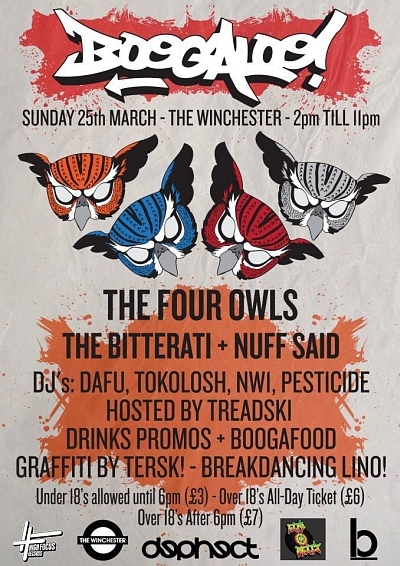 Backyard Boogaloo presents The Four Owls! If you download this click here and then click ‘Like’ on my facebook page, cheers! 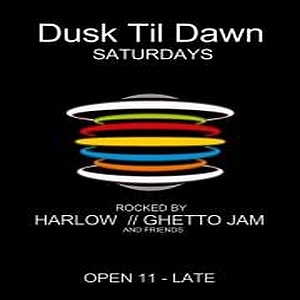 Warming you up nicely for the first Ghetto Jam event of 2012, Dafu lays down a dope mix to get you in the mood.